Broken down? Need a Wrecker? CSI pioneered the early days of slasher saws and pull through delimbers. Their quality service is known throughout the United States wherever logging equipment and manufactured house-moving equipment is sold and used. When you choose products manufactured by CSI you will receive both the highest standards of manufacturing and the professionalism of all their employee’s. This 4-knife pull-thru delimber comes equipped with an integrated topping saw. It is suited for use in hardwood or pine. The 72″ wide throat opening, a special roller, and our unique knife design makes delimbing trees smooth and easy. It comes mounted on a cradle constructed of high alloy steel. We also use top quality rotation bearings, pivot bushings, and rollers. Its ease of operation yields maximum production. 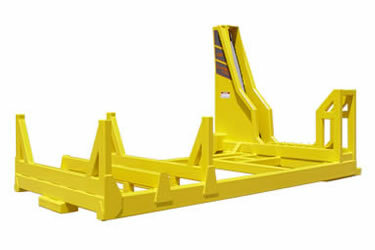 The DL-4200 is built with a low profile sawbox for great visibility and easy loading and unloading of tree stems. 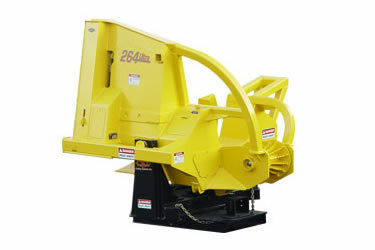 The DL-4200’s reliable and economical belt drive insures smooth fast cuts in any situation and provides exceptional performance even with low-flow hydraulic circuits on some loaders. A 44″ buck width offers the cutting capacity of larger slasher saws, while taking up less space on the landing site. The DL-4400 has what CSI calls a DOG LEG (DL) style saw box which gives the loader operator a better view plus more grapple room when pulling the tree stems up for the next cut. 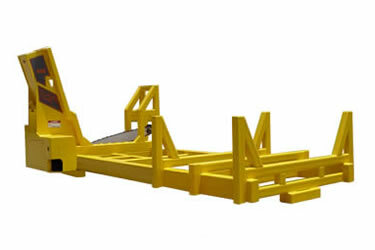 It is built from high strength tube and alloy steel by skilled workers to create a machine that is strong and durable. New innovations such as four larger 3/4 inch bar mounting bolts and a hydraulic cushion bar stop help maximize bar speeds.